That ended a 16 hour travel day from Austin to Toronto, with a 6 hour delay in Houston. Definitely not as smooth as the flight down through Chicago…I can only hope that the streak of crazy Sunday airplane stories doesn’t continue next weekend when I fly home from Philly. But you have to make the best of a bad situation. 3) That you always keep the right attitude…and never, ever, EVER give up. Now to be honest, my nutrition was not perfect on the weekend, but it was a good rest and I’m starting a new program this week so I will be starting conservatively…focusing more on bodyweight exercises. Next weekend…off to Atlantic City to hang out with Joel Marion again. That will be the 3rd weekend in a row…then I get a week off, and then to his wedding on August 7th. Then I’m off to Lithuania and Poland for an interesting trip, including some hiking in Poland. This week, we’ll cover workouts for busy people. On this program you only train twice per week, and each workout requires a very focused and intense 20 minute circuit. Repeat the circuit as many times as possible in 20 minutes. You can also do a barbell version instead. Diabetes Metab Res Rev. 2010 Jun 7;26(5):393-405. Enhanced weight loss with protein-enriched meal replacements in subjects with the metabolic syndrome. German researchers put these subjects on a diet (500 calorie reduction from baseline) and assigned to “high protein” or conventional protein. That is ONLY 0.61 grams of protein per pound of bodyweight. NOT MUCH! It was a 12 month diet and protein MRP’s were used. 67% of the participants completed the 1-year study. High-protein diet lost more body weight and more fat mass compared with those on the conventional protein diet, whereas the loss of fat-free mass was similar in both diet groups. J Hypertens. 2010 Jun;28(6):1186-93. Regular physical activity attenuates the blood pressure response to public speaking and delays the development of hypertension. Palatini P, Bratti P, Palomba D, Saladini F, Zanatta N, Maraglino G.
From Italy, 75 sedentary and 44 active participants screened for stage 1 hypertension with consistent activity habits and 63 normotensive individuals as control. The blood pressure response to public speaking was greater in the hypertensive than the normotensive participants. Active participants were less likely to develop incident hypertension than sedentary ones. Regular physical activity attenuates the BP reaction to psychosocial stressors. 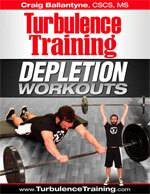 There is no 3rd workout in the Depletion program, so I wanted to mention how my workouts typically look. I start by doing self-massage using an acuball and foam roller. Then I do dynamic stretches and bodyweight exercises, and even a few static stretches. Then I start the training with an explosive exercise first – such as jumps or med ball throws. Then I move to the main exercise, such as squats, deadlifts or presess. I follow that with assistance exercises, mostly bodyweight versions. Finally, I finish with ab endurance exercises. Yet only 19 percent say they are tracking calories. And only 12 percent were able to accurately estimate the number of calories they should consume in a day. 60 percent also say they are engaging in physical activity to lose or maintain weight. But 77 percent – the same percentage who are trying to manage their weight – are not meeting the government’s physical activity guidelines, notably the recommendation to include strength training, and roughly a third of Americans perceive themselves to be sedentary. Get more education! That’s what I’ll bring you, of course!